complete build-up milling machine / router with 20mm thick linear guidances for X and Y axis, magnetic reference and limit switches on all axles. Its your selection. The new version 2 of the very much loved and tested CNC-Controlling Software Win PC-NC is out now and available in 3 different variations. The menue manuel move for driving manual to every points within the working area. Fast or slow drive to many different points ( parkpoint, referent point ) possible. The menue machine is configured ready if you order WIN PCNC and a machine like the High-Z. Here we demonstrate how precise our machines perform, when used for reverse operations or repetitive operations. Please click here. We suggest a maximun traverse speed of 1250mm/min (High-S S-720) on purpose to ensure longlasting performance and to avoid small and unnecessary resonances during milling. Actually the electronic performance is not fully used, as the following videos will show. Videos demonstrate examples of milling in 4mm, 8mm timber, plastics, MDF and solid Aluminium as well as simple techniques with usage of measuring device in order to show precision. Platinen circuit boards fraesen CNC CNC Fraesen von Platinen-werkstoffen CNC PortalfrÃ¤smaschine frÃ¤sen in Kunststoff CNC Fraese Messing fraesen Fraesen in Vollaluminium CNC Fraesmaschine 3D Fraesen in POM 3D frÃ¤sen mit der High-Z FrÃ¤se von HEIZ CNC-STEP 3D Relief FrÃ¤sen in Holz oder Aluminium 3D Fraesen einer kleinen Teekanne mit der High -Z Fraese 3D Taster Scanner CNC Frase Fraesmaschine Video CNC FrÃ¤sen in 10mm Spanplatte grob The "RaptorX"- video shows our brandnew machine called "RaptorX" with a complete undersonstruction made from steel ( available in approx 8 weeks ). Professionals, model makers and hobbyists have long been waiting for this machine. Together with our development department and engineers from the machine construction and electronic sector, we have developed a machine, which is setting new standards with regard to dimension, cost/perfomance ratio and stiffness as well as stability by its new geometry. Besides, it excels by its variety of applicability, which is due to its new frame construction. Because the frame is of aluminium, it is also possible to work with an atomized spray plant, which is not possible “ of course “ with an understructure of particle boards! Additionally, this way you can work at bigger working pieces in stronger bench vices. The complete construction is all in all by approx. 50% lighter. Place the Machine firmly on a 4x5 meter PU-Plate and mill individual letters out........no problem. No specific CNC programming-knowledge is necessary for the operation! You simply create drawings, model sketches or texts in a drawing programme, e.g. Corel Draw, CAD programmes etc.. These may easily be sent to the milling machine as HPGL-file from the delivered CNC-Software PCNC. Many settings can be made in the software e.g. Verfahrgeschwindigkeiten, Scaling, series of milling, immersion depth of the individual tools etc. The operation is so very easy, once you have become acquainted with the software! Also 3D “ Milling is possible with this machine. Three-dimensional objects can e.g. be created in a 3D-CAD system in STL-format and subsequently the file is imported into the software DeskProto, tools parameter, infeed, strategy, accuracy etc. determined and finally put out as CNC-programme, which can be worked off with PC-NC or WinPC-NC. For example, the milling unit is by far superior to the competing products with regards to the stiffness, manufacture and therefore long-term precision of many much more expensive machines We focus specially on the storing of the threaded spindles. Those are in X and Y at both sides in grooves and thrust ball bearing so that no power is transferred to the engine camp, which is rather unusual in this price segment. A further "Plus" is the frame construction, which allows it to set up our machine with the help of our Z-Kits higher from the ground, so that e.g. working pieces can be clamped in strong bench vices and belabour them. An alternative can be to place the complete machine onto a big housing in the dimension of e.g. 1x2x3 meter and mill a breakthrough etc. All this is no problem with the High-Z. With a working area of x-720, y-440, ( at this construction, therefrom results an actual working area of 720 x 440 mm ! ), z-110 mm and a passage height of 100 mm as well as a repeat accuracy of 0,03 mm and a maximum positioning speed and a working spped of 1250 mm/min. it is for almost all milling and engraving works in plastics, wood as well as easier chipping in aluminium or messing etc. particularly suitable. Of course, this CNC- machine may also be used for blank drilling, insulation milling or even for cutting of plastic films . Another possibility: use the machine for plasma-burn and build a holder for a mobile plasma-burner. The machine slides are guided in all 3 axes on highly precision 62 Rockwell hardened and grinded linear guide ways with a diameter of 20mm ( Z-Axis: 12mm ). This leads to a very high twisting rigidity and allows even milling works in massive aluminium Please also watch our videos hereto. The threaded spindles are of course running in ball bearings on both sides, so that no power can affect the motor mountings and supports. In 99,9% milling works up to a material depth of 5mm maximum thickness can be executed. Only seldom 80, 90 or 100mm thick working pieces have to be belaboured. Most machines of our competitors use a construction, with an Y-Axis center is of approx. 300mm minimum height above the machine base. Of course, such constructions bring about high leverages and breakdown torque during belabouring of thin material. This has not only an impact on the accuracy of the working pieces, but also on the long life cycle of the machine , if not parts of high quality are implemented in the machine. The sketch shows the red force distribution line of a machine construction which some competitors make use of. For clamping of flat or even complex working pieces, you may fix an MDF-Board easily to the base plate, to mill it one time smoothly and affix them easily with e.g. thread inserts for wood and with the help of mounting links. For flat materials or for engraving, you only fasten a further, but plastics coated board on the MDF-Board. It is very easy to fasten safely flat and thin material with double-sided adhesive tape. A downholder for engraving works will additionally be delivered free of charge, providing that the thin engraving material always is laying flatly on the base, so that different engraving depths can be avoided. In the sketch you may recognise with the force distribution line how warp resistant our machines are constructed. In a few weeks a rototing axis is coming too. 3D milling in wood ( the milling file is made with our 3d scanner ). With magnetic reference and limit switches on all axles !! Maximum reversal clearance approx. 0,025mm ( to be adjusted by software up to 0,000mm accuracy). With this machine your can do CNC-milling, engraving etc. It is ideal for the creation of small name plates for doorbells, air plane model making, gliders, sail planes, doll's houses, railway model making etc. CNC milling in aluminium, brass and cfk, gfk. Carbon. CNC-milling in metal or plastics and carbon as well as fibre glass. mold making, air plane model and railway-models, wheels, air-pressure tank, valves, cylinders, rams, wheel-rims etc. Also for the RC-Car area and boats, model boats, helicopters etc. The spindle of Kress , 3-divided T-groove plate, base plate from ply wood. The pictures shall only illustrate how the machines can be changed for the different applications . Machine is completely cabled for connection to the control, which is also included in this delivery as well as 40 pages of operating instructions and all connecting cables with plugs for the 3 axes, as presented in the picture with the red 1 ++ the Kress Milling Spindle ( Router )..
inclusive renowned CNC-Milling Software PC-NC or WIN PCNC Light. More info, see -PCNC Lewetz- in Google. Together with this delivery we give you a CD with more than 5000 finished, vector graphics to be cut or engraved free of charge. Further more, we give you a knife holder including the appropriate Euro Neck-Holder, in order to be able to cut plastic films also free of charge ( normal sales price: 149 Euro ). Of course, the machine will be delivered together with a regular invoice. Final Price is gross price. In your and our interest we will try to keep the extremely narrow calculated start-offer here in E-Bay for some months. However, we cannot forecast how long this will be. If you are situated inside the EU and get a UID Number or if you are situated outside the EU you dont have to pay for german VAT, so all our products are 16% cheaper for you as discript !! In case of further questions, we will be pleased to answer your questions at the normal hours of business. Place of Business is in 47608 Geldern (Germany) near the German city of Krefeld. No shop rooms. Please make an appointment for presenting the machine, which should be coordinated on the phone. CNC-Machines are available with four or five channel controller, with an 110 Volt variant too. 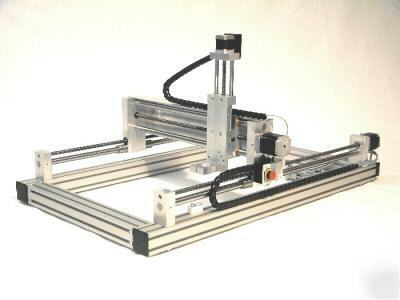 Please request for more informations about the CNC-router. Copyright 06.2006 by F.Hylewicz / Fa. HEIZ CNC-STEP Layout und Fotos sind Eigentum der Fa. CNC-STEP. Das Kopieren von Bausteinen dieser E-Bay PrÃ¤sentation ist nur mit ausdrÃ¼cklicher schriftlicher Genehmigung der Fa. CNC-STEP erlaubt.